The big fancy burgers at supermegaburgerchain Red Robin are pretty good. So why would you order a glorified French dip here? Well, it's pretty glorious. And sometimes you just want a hot beef sandwich and some hot beef juice to dip it in. 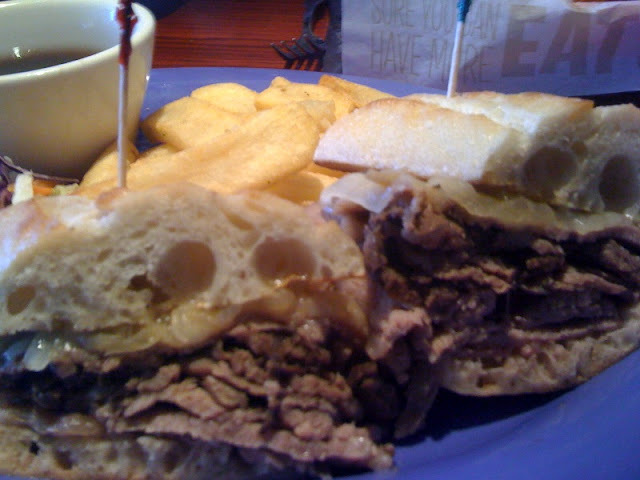 Red Robin claims to use prime rib in this sandwich. Maybe it is. Doesn't matter. It's tender, juicy, and flavorful enough. There's melty provolone cheese and caramelized onions. But the second most important part of a dip, after the beef, is the bread. It needs to be strong enough to survive a salacious dunking in au jus, yet still soft enough to bite and chew, all while maintaining its own flavor. This rustic roll does the trick. A solid choice, especially when you can't decide which weird Red Robin burger to order.